For years I read, preached and taught from the KJV. I appreciate the language and love the translation, but made the transition to the ESV several years ago. And I’m thankful we did. So when I saw this new booklet from Kevin DeYoung I was intrigued. 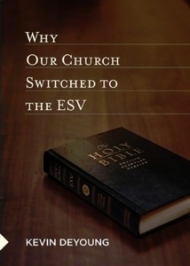 It is an excellent little work for anyone considering making a switch to the ESV personally or as a church. If you’re not familiar with the ESV, be sure to check out the great selection of ESV Bibles including the ESV Study Bible. Kevin DeYoung shares seven reasons why he encouraged his church to switch Bible translations to the ESV. A few years into his current pastoral role, Kevin DeYoung was faced with a church that needed to replace its well-worn pew Bibles. DeYoung wrote to his congregation, outlining seven reasons why he preferred the English Standard Version (ESV) and was proposing its adoption. Among his top reasons for switching to the ESV DeYoung noted its essentially literal translation philosophy, avoidance of over- and under-translation, consistency in translating important Greek and Hebrew words, and retention of important literary features.